1. Sending help to students in Mexico in the form of shoes, backpacks & pencils. We do this because shoes, backpacks & pencils are used to exclude children from getting an education if they lack them. 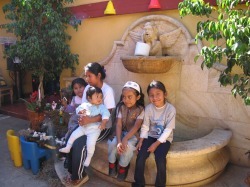 We bring shoes backpacks and pencils so ALL children of Mexico can receive an education. 2. Logistics support to other educationally inspired nonprofits such as TALICA (talica.org) Teaching and Learning Initiatives in Central America. We hope to help TALICA deliver large numbers of books around Central America.